Less than two weeks before we leave NYC. Holy cow. Not so calm anymore. This week’s big task is closing down my studio. Sorting supplies. Selling furniture and equipment. Gifting some of my crafts to friends and students. Packing everything else up, because it’s time to go. I don’t like good-byes. There are quite a few of those this week. I suppose my panicked packing and sorting state will serve as a good distraction from the sadness of farewells. Stitched and me. What a time we’ve had. High hopes. A huge learning curve. Lots of new friends. Some tough times. But even more good ones. 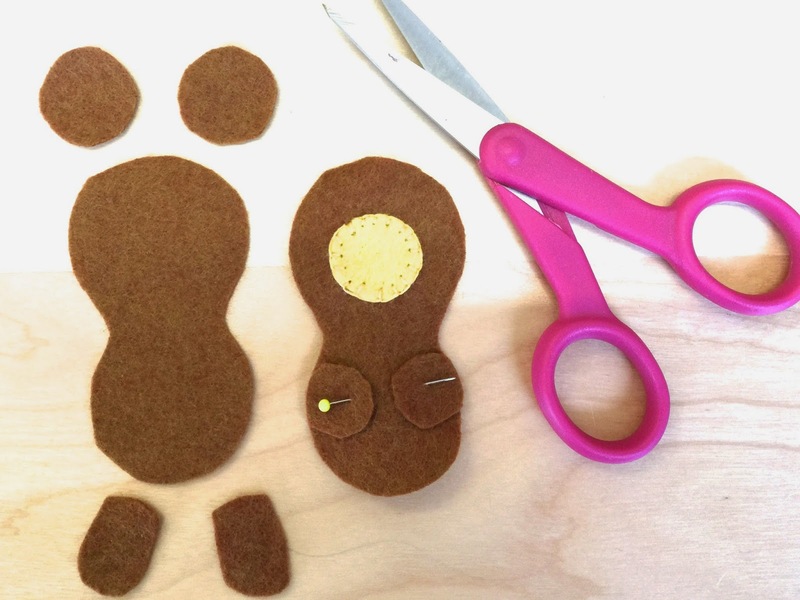 I’m so glad for the chance to share my love of making and crafting through lessons and classes. Some crazy weeks coming up. Please excuse me if I post only sporadically during our moving time. But once we’re in our new home, I’m anticipating lots and lots of serious crafting, gardening (and harvesting? ), cooking and exploring opportunities. Stay tuned, ok? 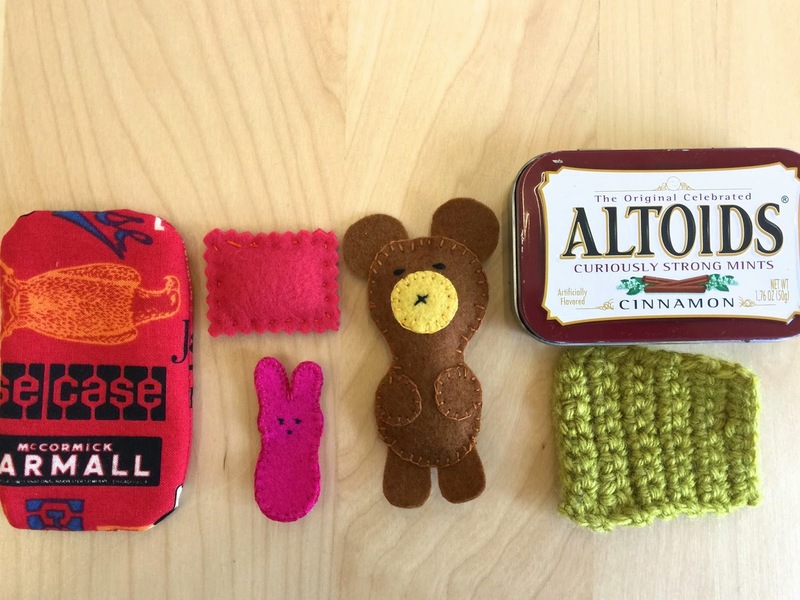 A friend once observed that crafts usually fall into one of two categories: Cute or weird. Weird makes folks stop and look twice. Weird is a edgier. Possibly tongue in cheek. Definitely cooler. I often wish I could produce weird. Maybe someday I will. But thus far, most of my crafts land smack dab in the cute category. Can’t help myself. I just like cute (I confess to still having a thing for Hello Kitty too). So when I came across this little guy on Pinterest, I thought he was so cute, I had to make one as well. My bear is bigger than the original bear. 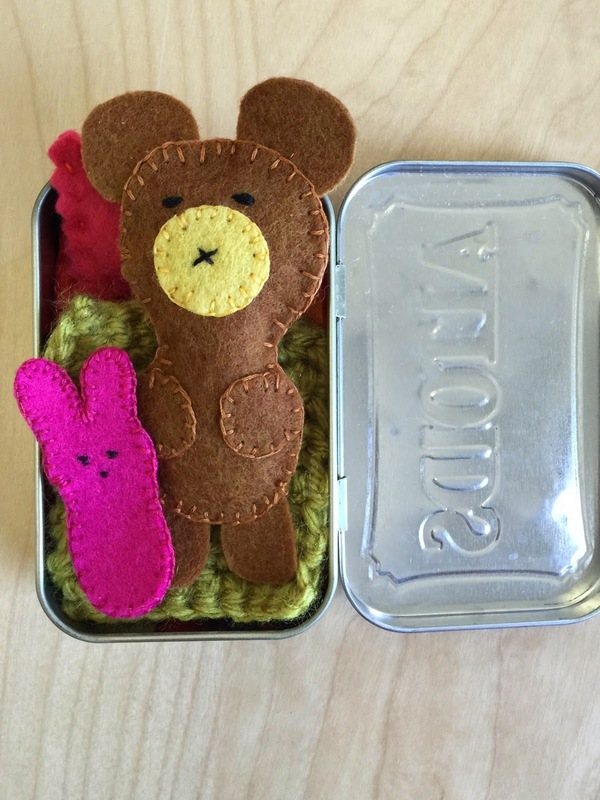 Original bear was sized to fit in a mini-Altoid tin. Mine fits in a standard Altoid tin (so my guy is about 3 1/2 inches tall). I started with some careful cutting. I made a paper pattern for his body, but cut all the other parts out free hand. Next I moved onto lots of tiny stitches. I’m sure this could be done faster, but I try never to rush when stitching by hand. 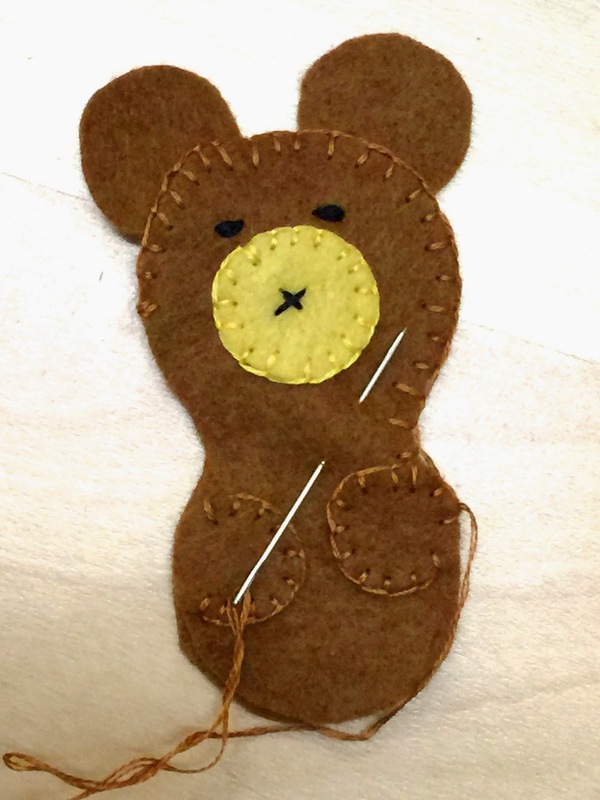 Cutting and sewing bear took me close to 2 hours to complete. 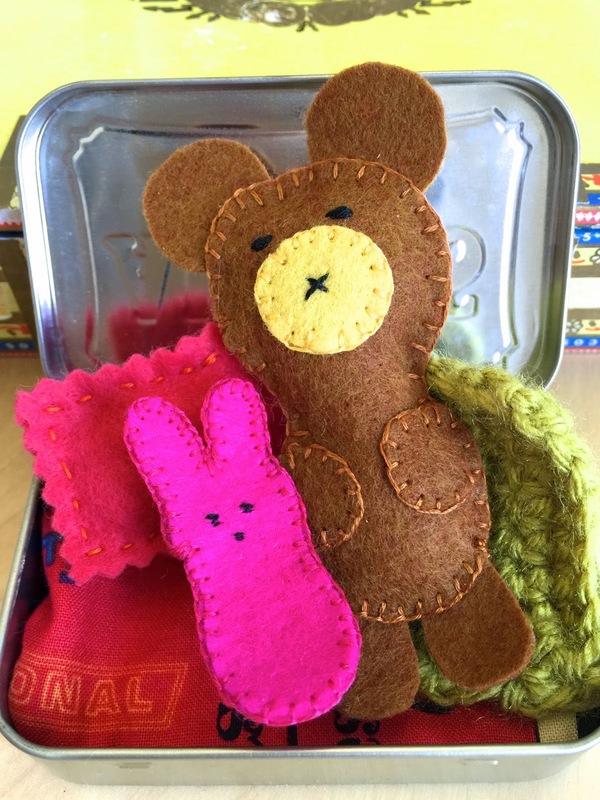 Once I finished with bear, I hand stitched his pink bunny friend and pillow, machine-sewed their mattress and crocheted a little blanket for them. All that is left to do is to decorate their Altoid tin bed (actually, the box with the lid reminds me more of a coffin, but I won’t mention that to the little girl I’m gifting this to). And there they are. Bear and bunny. All tucked in nice and cozy. Pretty darn cute, don’t you think? One calm and peaceful moment to savor and remember. Sitting on a bank of this quiet river. Watching the light dance on the water. Listening to my boys skipping rocks. So much to juggle in the next few months. Thinking about everything we have close out behind us. While simultaneously making lists of everything we need to take care of in front of us. Til self is practically paralyzed from overload. Imagine floating down this gentle river on a raft. Feel the sunlight on my closed eyelids. We visited the Biltmore Estate during the kids’ most recent school holiday (doesn’t it feel like they are always on holiday?). My boys and I spent one day exploring the Biltmore House. Unfortunately, pictures weren’t allowed so I can’t share with you how incredible the place was. If opportunity arises, I highly recommend a visit there! We spent a big chunk of the next day traipsing about the inn premises. 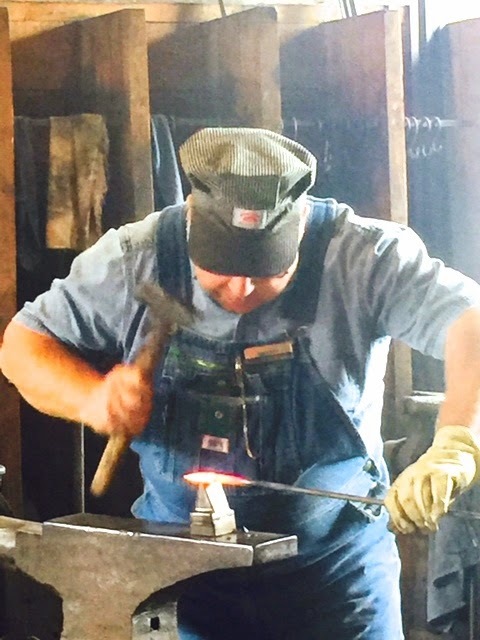 During our rambling walk, we stumbled across Doc Cudd’s most impressive blacksmithing demonstration. 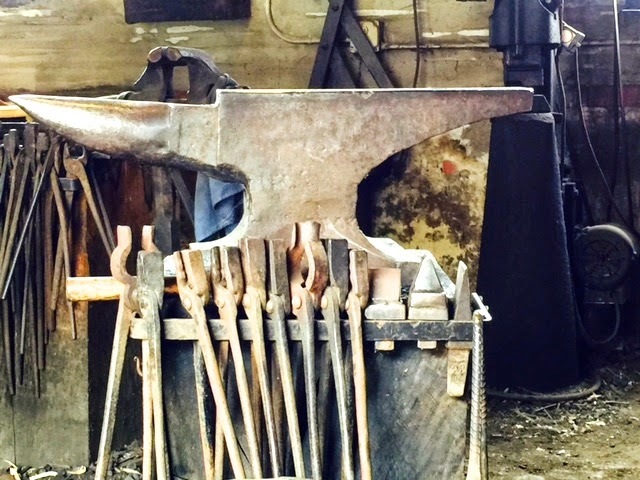 Doc comes from a family of blacksmiths dating back over 400 years. 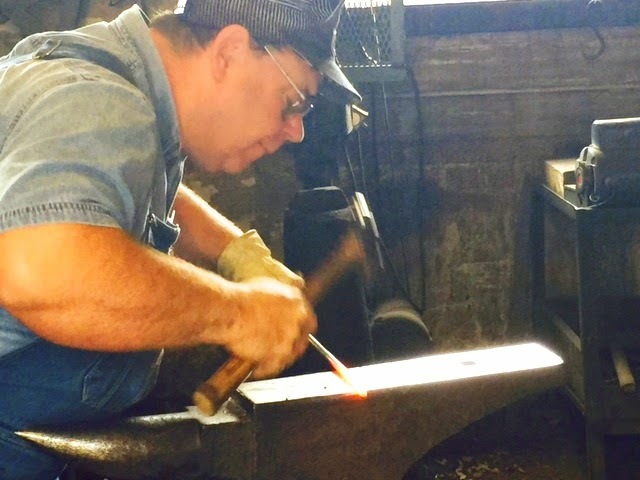 He told me he got his first anvil when he was 9 years old and to this day, loves working with it just as much as he did when he first started out. I know nothing of the art of blacksmithing. 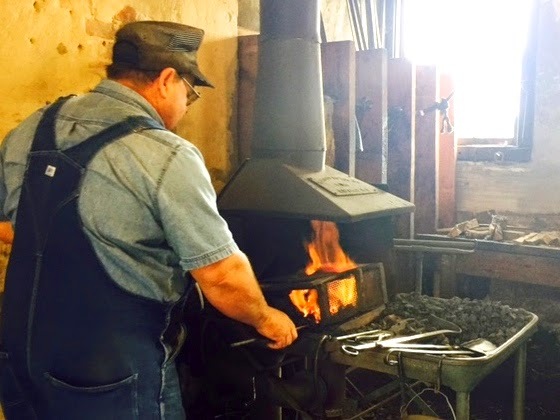 But when I watched Doc standing before the forge, with his hammer and anvil, I knew I was seeing a master at work. Think I could have stood there all day watching him effortlessly “tapping” out the rhythm with his hammer in one hand while manipulating the iron rod with his other hand. All the while telling us stories in his low, smooth, melodic voice. If you’re interested to read more about Doc, here’s an article on him chock full of details. 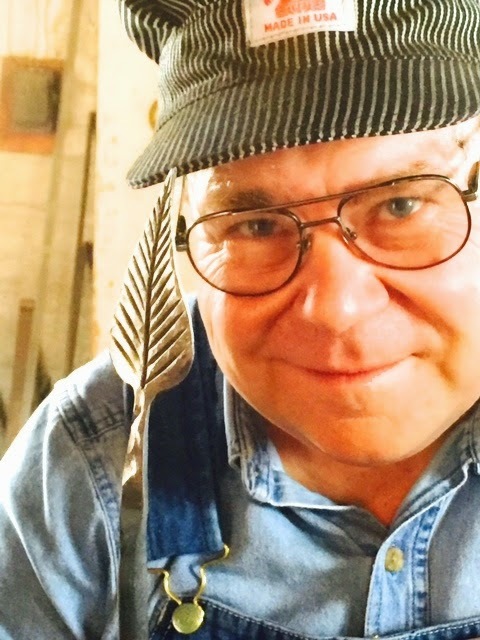 What a privilege to meet this master blacksmith. Thank you Doc, for sharing your art. And for letting me stick around to pester you with questions and for making the second leaf for me. I am inspired by your dedication to and your care for your work. I love it that you don’t worry about how long it takes to complete each piece; that you just want it to be right. Thank you.